Update: NASA says the launch was scrubbed due to a boat in the hazard area. A second launch attempt has been scheduled for Tuesday, Oct. 28, at 6:22 p.m. EDT. If you live along the U.S. East Coast, you have a great opportunity to see a rocket launch from your own backyard Monday evening, Oct. 27, but you'll need to know when and where to look to spot the brilliant liftoff. 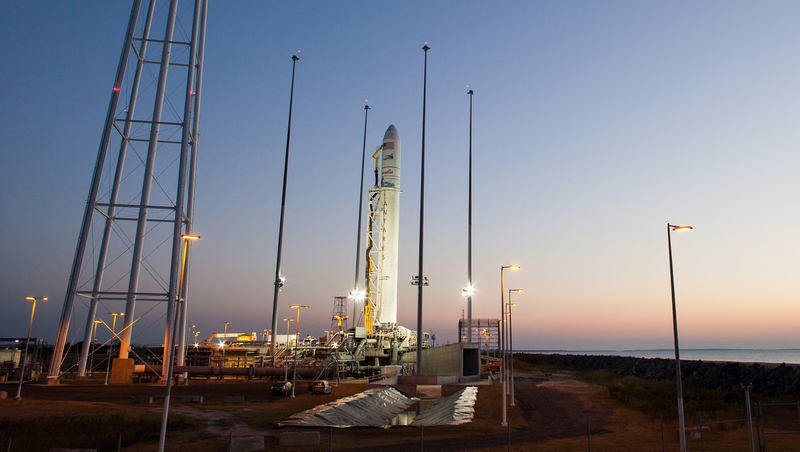 Early Monday evening, a commercial Antares rocket built by the Orbital Sciences Corp. is due to blast off at 6:45 p.m. EDT (2245 GMT) from a pad at the Mid-Atlantic Regional Spaceport on Wallops Island, Virginia. It is the first-ever night launch of the two-stage Antares rocket, and the flight could be visible from Massachusetts to South Carolina, weather permitting. The Antares rocket will launch an Orbital-built Cygnus spacecraft on Orb-3, the third official cargo delivery mission to the International Space Station for NASA under a $1.9 billion deal. If all goes well, the robotic Cygnus spacecraft should arrive at the station on Nov. 2 to deliver nearly 5,000 lbs. of supplies. Views of Monday night's rocket launch will be different depending on where you live on the East Coast. The further away you are from the launch site, the closer to the horizon the rocket will appear during its ascent. As a reference, your clenched fist held at arm's length is roughly 10 degrees in width. If a skywatcher is trying to spot the launch from Philadelphia, for instance, the highest point the Antares rocket will reach is approximately 13 degrees above the horizon. It's unlikely that an observer will be able to view the launch when it's below 5 degrees above the horizon because buildings, vegetation, and other terrain features will probably get in the way. Editor's Note:If you snap a photo of the rocket launch and want to share it with Space.com, you can send in images and comments to: spacephotos@space.com. As seen from Philadelphia, Orbital Sciences' Antares will reach 5 degrees above the horizon about 100 seconds after launch. Antares' launch will be visible along the East Coast by virtue of the light emitted from its two stages. The first stage uses kerosene and liquid oxygen as propellants, powering two Aerojet AJ-26 engines, which are modified Russian-built NK-33 engines originally developed for Russia's N-1 moon rocket. Antares should appear as a bright, moving star. Observers who use binoculars might be able to see a tiny V-shaped contrail. Because the first stage of Antares is liquid fueled, its ascent is slower than the Minotaur rockets that have launched from Wallops in recent years. At approximately 180 seconds after launch, the spacecraft will have risen to an altitude where it will begin to be illuminated by the sun which could make it appear brighter. Antares will jettison its first stage once it has spent all its fuel, 239 seconds after launch. This harmlessly breaks up in the atmosphere and falls into the Atlantic Ocean. Then comes a coasting phase, which lasts about 47 seconds after the first stage shutdown; the sunlit rocket should continue to be visible, followed by ignition of the second stage, 4 minutes 41 seconds after liftoff. The second stage is a solid-fuel rocket, the Castor 30XL. The rocket's second stage will burn for 166 seconds and then, along with the Cygnus cargo ship, Antares will be put into a low-Earth orbit. Once it separates from the second stage 9 minutes, 27 seconds after launch, Cygnus will then use its own engines to continue on its own for its mission to the International Space Station. The second stage will appear farther downrange and at a lower elevation than where the first stage shutdown appeared. The trajectory appears to dip back toward Earth as the rocket moves further away from the observer and disappears beyond the horizon. The rocket of course, is not returning to Earth -- it is continuing its ascent, speeding higher and faster toward space. Eastern Half of South Carolina/North Carolina/Coastal Virginia: Liftoff to Stage 1 shutdown, primarily toward the northeast. Stage 2 ignition, for the Carolinas, east; coastal Virginia, southeast. Public viewing of the launch will be available at the NASA Visitor Center at Wallops. NASA has more information about the Visitors Center on its website. For any questions about viewing the launch from the Visitor Center, call: 757.824.1344. For updates on the launch, call: 757.824.2050. Android users can download the new "What's Up at Wallops" app, which contains information on the launch as well as a compass showing the precise direction for launch viewing. The app is available for download here. Orbital Sciences has named its Orb-3 Cygnus spacecraft the SS Deke Slayton in tribute to original Mercury 7 astronaut Donald "Deke" K. Slayton, who flew on the Apollo-Soyuz Test Project mission in 1975 and championed commercial space endeavors after retiring from NASA in 1982. Slayton passed away in 1993. The Orb-3 mission follows cargo launches in January and July, and a test flight to the station in April 2013. Under its $1.9 billion contract, Orbital Sciences has five more cargo runs to the orbiting outpost for NASA.